Is My Email Hacked or Is it "Phishing"? Windows 10 is Here..What Should I Do? Click Move messages from someone to a folder and click Next. In the Step 1 screen, from people or public group should be selected. In Step 2, click the words people or public group and select the email address from your address book or type it in. Next, select the word specified to select which folder to send the email to. Either select the already created folder or click new and name the folder. Click Next. You will be able to add more conditions if you choose. When done click Next. Name the rule while making sure Turn on Rule is selected and click Finish. Another rule you might be interested in is one I set because I have emails from multiple accounts all going to my main outlook box. Follow these rules to move all e-mails sent to a specific email address to a designated folder. Create a new folder to organize the email in. Click Move messages sent to a public group to a folder and click Next. In the Step 1 screen, sent to people or public group should be selected. 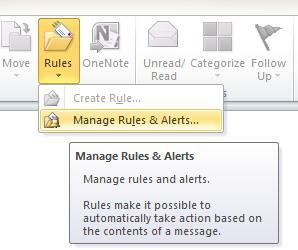 Next, select the word specified to select which folder to send the email to. Name the rule, make sure Turn on Rule is selected and click Finish.